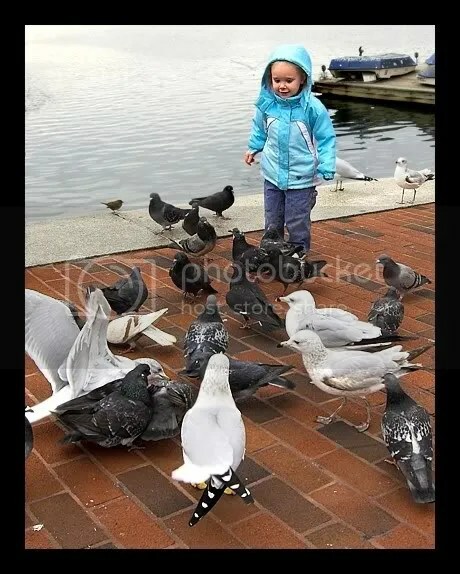 A couple of weeks ago wen we went to the harbor, I brought along some stale old Cheerios so T could feed them to the birds. 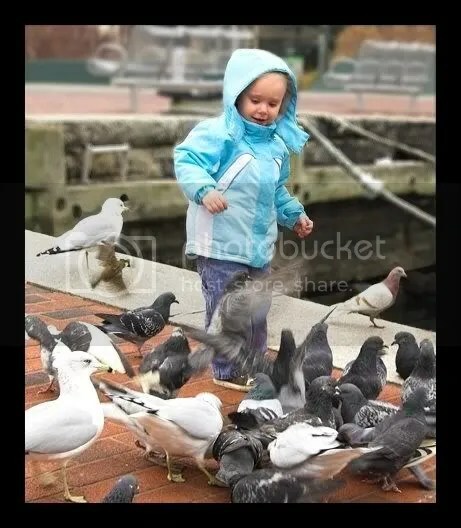 She loved every moment of it, and giggled maniacally as the pigeons and gulls surrounded her with their flapping wings and fought over the tasty treats we tossed down for them. These birds are not shy in the slightest bit, very much unlike the little sparrows and starlings that live in our own backyard, and it was a fabulous experience for Super Puff. She would have been more than happy to feed the birds all day, I think. But all good things must come to an end, and eventually we ran out of goodies to share. . .
Once it became clear to her new-found and fickle feathery friends that Puff’s supply of snacks had been completely exhausted, they took flight in search of some other suckers who might give them a free meal. We also went on about our business, and we had a wonderful day, but Puff didn’t forget her hungry birdy friends. 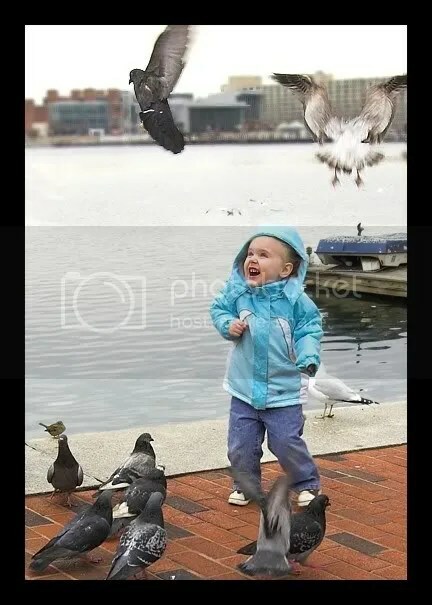 . .
Heehee, I remember your post about the girls feeding gulls. You got some great shots! It was a really fun thing to do – and, like Kendall said – cheap and quick! I must say, that last photo could almost be from “The Birds.” They almost could be attacking her (not that they are…thank goodness). Really, what is the continued part? Guess I’ll have to stay posted. It was actually quite comical, they flew right over her head. She wasn’t expecting it at all – but was thrilled, if a little bit startled! In that picture she was laughing and squealing at the same time. . .though I suppose if you don’t know that she could look quite frightened. She wasn’t! And yeah. . .part 2 was fun, too, as you shall see! I hope for part 2 you found ducks or geese at least, cause pigeons are kind of like seagulls . And love the Mary Poppins reference. Love that movie and all the songs. Her face in the last picture = pure win!! Hahahahahahah! the looks on her face=priceless!